Use the Power of Subliminals and Your Unconscious Manifestation Abilities to Get Clear... REALLY CLEAR... on What the Divine Wants for You! Most of us know what we want. We want the new house, a better car, peace in our relationships, maybe even a new relationship. Most of the time, our desires are not all that grand. We just want a little more to give us more peace and less stress in our lives. The trouble is, we're operating from a belief system that can only see what it knows. The new house in our minds is probably only a little bigger than what we have now. The new car may only be a slightly better model than what we have now. But what does the Divine want for us? Are we inherently limited in what we can manifest from our conscious minds... simply because our conscious minds can't see much more than the immediate world around us? Yes, fortunately so. No matter how much you consciously attempt to manifest a better life, you're limited by your own beliefs, emotions, and world view. Fortunately, the Divine has ZERO limits. The Divine is brimming with love, abundance, happiness, and joy... and it is simply waiting for you to open to its possibility. All you have to do is get out of the way of the Divine gifts for you. These gifts are your birthright... your birthright as a Child of the Divine. This state-of-the-art Subliminal Manifestation program can help you clear your negative beliefs and emotions so that you can get back to that Zero State... the place where Divine manifestation has bigger and brighter dreams for you than you could ever devise on your own. This is the only program containing information and trance from Dr. Ihaleakala Hew Len, Joe Vitale, and Mark J. Ryan... and this program was specifically designed to engage both your conscious and unconscious mind in getting clear. 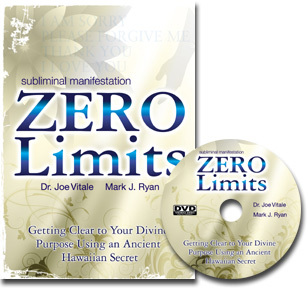 I watch the Subliminal Manifestation Zero Limits DVD a lot. That one section where you and Joe introduce Hew Len to the audience is super! I listen to it almost daily and get something new from it each time. It may be 6 hours later when the new understanding arrives. A good video!!! 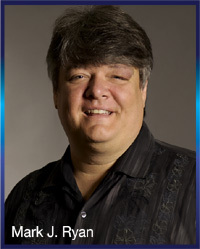 Subliminal Manifestation: Zero Limits uses the ancient Hawaiian healing methodology called ho'oponopono, the methodology that Dr. Hew Len used to heal an entire ward of criminally insane patients in the Hawaiian Correctional System. This amazing ancient methodology is so simple... yet so profound... in how it helps you gain greater understanding of how you -- and the Divine -- co-create your reality. I received the the new Zero Limits DVD yesterday and plugged it in last night. It was an exhausting day and I fell asleep midway through it. So this morning I awoke around 4:00am and plugged it into my laptop. During the intimate clearing with Joe that was recorded in Peru, I broke down in tears. I wasn't sad, just extremely overwhelmed with emotion. Not sure what overcame me, I just know it was perfect. But here is the really cool part. I was doing the Inner Child meditation with Mark Ryan and something amazing happened. Towards the end of the meditation, my Inner Child and I were actually doing Ho'oponopono together like it was a fun game to play. It became a child's song that we were singing together. It was absolutely beautiful, but it didn't end there. 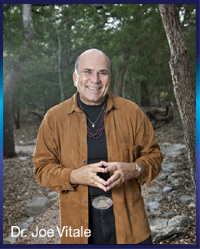 I recently read a book by Dr. Wayne Dyer, "Getting In the Gap", in which he writes about a meditation called Japa. After the Inner Child experience I was inspired to continue my meditation, so I got in the Gap, and proceeded with Japa. During this meditation, my Inner Child appeared beside me and asked if it could do the Japa with me. There we were, Mother and Inner Child meditating together for a common purpose. Thank you gentlemen so much for this gift. I know this is just the beginning and I am so excited of what every moment brings. And Dr. Hew Len, Joe Vitale, and Mark J. Ryan help you learn how to open to a greater manifestation of abundance, healing, and happiness in your life experience. This program contains nearly 3 hours of video! I just finished watching Zero Limits. It is fabulous beyond words. Your production abilities are a gift.